How much energy can I use? When you join Community Power Network, you are allocated an annual power allowance through sonnenFlat, who administer the network. Your annual allowance depends on the size of your system and the applicable sonnenFlat package. How can I keep track of my annual energy use? Your sonnenBatterie records your usage over the 12 months period. Download the sonnenApp for smart phones and tablets to keep track of your annual and daily usage, and to control the supply and demand of your household. What happens if I use more than my allocation? If you use more than your allowance, you will only be charged for the excess consumption at a low competitive per kWh energy rate. If this does happen, you will receive a bill from sonnenFlat. What is the monthly fee for the Community Power Network? For the first 24 months, there is no fee for being part of Community Power Network. After that, there is a small monthly administration fee depending on your sonnenFlat package. We think it’s a small price to pay for freedom from rising retail energy costs and uncertain power supply and blackouts. What sonnenFlat packages are available? South Australia and NSW - Essential Energy Network customers will have an extra $12+GST above the standard monthly fee. Consumption from the grid in excess of annual energy allowance will be charged at competitive per kWh rate. Package Prices exclude GST. Rooftop solar systems convert energy from the sun into direct current (DC) electricity. This is then fed into a solar inverter and converted into alternating current (AC) electricity, which can be used immediately, stored in a battery or exported to the grid. The inverter also ensures that the energy being generated is used first before drawing any extra from the grid or battery. When the system does need to switch from using solar power to battery power (if one is connected) then grid energy, like at night, it does this automatically. How long will my system keep performing? If your system has Tindo panels, you can expect a minimum of 25 years high performance. Which means they’ll still be generating at 80% capacity when they hit that milestone. Additionally, they have an easy to understand, customer-friendly product warranty of 12 years. If your system has a sonnenBatterie, it has a 20 year Design Life backed by an industry leading warranty of 10,000 cycles (2.7 cycles per day) or 10 years before battery storage level degradation. A family of two kids and two adults who use most of their power in the evening (washing machine, dishwasher, TV, laptops) would typically require a 7.5 kW system, while a retired couple who use most of their power during the day would typically only need a 5 kW system. Your Community Power Network consultant can help you decide on the right size of system. Generally, solar energy systems are maintenance-free. They may only require a quick hose down and gentle brushing with a soft broom during prolonged rain-free periods or to remove bird droppings. This will help them to operate at peak performance. If you’ve purchased Tindo solar panels, maintenance beyond this gentle cleaning will be the responsibility of Tindo. sonnenBatteries are ‘plug and play’, making them simple to install and requiring no maintenance. If there is an issue with the battery or supporting circuits, the sonnen logo on the front of the unit will change from blue to red, or in some cases go out altogether if it shuts down. If the sonnenBatterie is not working optimally, an automatic notification will be sent to sonnen’s local technical team who will remotely fix the issue or arrange a visit from a technician. Will I receive a bill from my electricity retailer? Once you are connected to Community Power Network, you will receive a final bill from your electricity retailer for any power you used during that billing cycle. After that, you’re free from spiralling retail prices! Will I receive bills from anyone else? Community Power Network is administered by sonnenFlat, so the monthly administration charge will be billed through them. This is only charged after the first 24 months, so until then you can expect to be bill free. Can I claim the feed-in tariff? No. The excess energy you generate is stored within your battery rather than being fed back into the grid. You also allow Community Power Network to access a small amount (3-5%) of that stored energy to help stabilise the grid and supply other users within the network. Is my system eligible for any rebates? There are two types of rebates available for solar power in South Australia: the Federal Government’s STCs and the renewable energy feed-in tariff, which varies between electricity retailers. Previously, there was also the South Australian Government Solar Feed-in Scheme, which enabled better feed-in tariffs. However, this is now closed to new participants. While both of these schemes have helped to make solar power more affordable and increase its uptake, escalating retail electricity prices mean solar power is a smart investment for now and in the future. From October 2018, the South Australian Government is also offering a rebate of up to $6000 on solar batteries for 40,000 homes. To help Australia meet its Renewable Energy Target, the Federal Government issues renewable energy certificates for every solar energy system installed. Residential and small business customers are covered by the Small-scale Renewable Energy Scheme (SRES) and receive Small-scale Technology Certificates (STCs). These must be calculated within 12 months of a system being installed and are based upon geographic location, installation date, and the amount of electricity generated or displaced megawatt hours (MWh) over the system’s lifetime. Finance is available through Cool or Cosy’s Solar Rental Company, which has helped thousands of Australian households enjoy the benefits of solar energy. The application process is quick and easy with no deposit needed. Flexible terms from 12 months to 10 years mean you can Rent-to-Own with repayments that work with your household budget. In fact, your system can be cash flow positive from the start, meaning that your electricity savings can often be more than the monthly cost of the system. All of the Rent-to-Own systems are fully maintained and serviced by Cool or Cosy during the finance period. To participate in the Community Power Network, you will need a suitable solar system (5.0kW or above) and a sonnenBatterie eco 8.8 (or above). You can sign up with your own solar system or a new one installed through Community Power Network. Community Power Network is an energy tariff delivered as a sonnenFlat package. You receive a guaranteed annual allowance of energy for a low monthly fee and in return some of the energy stored in your battery will be used to help stabilise the grid without affecting your household consumption. When you join Community Power Network, you are signing up to a sonnenFlat package. Your solar and sonnenBatterie system will cover a large portion of your energy consumption, but not all. Therefore under a conventional retail bill you would still have energy and fixed supply charges to pay. 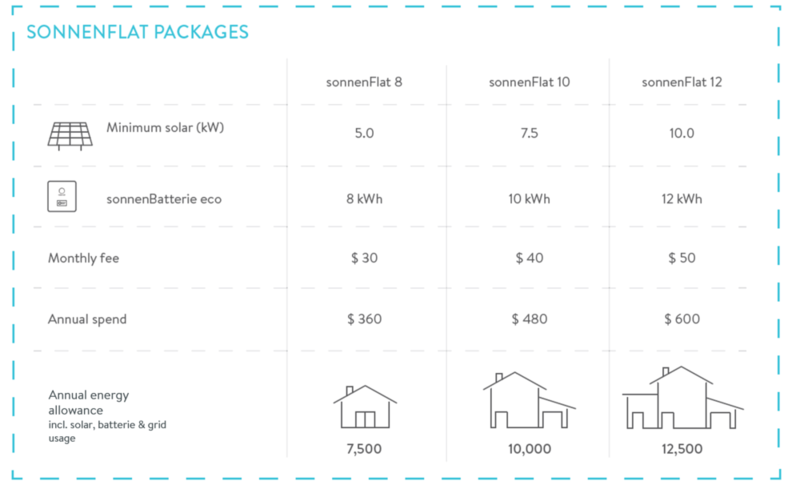 Your sonnenFlat package will replace these charges with one low monthly fee, saving you money on electricity bills. Your sonnenFlat package offers you a monthly electricity allowance for when you’re not drawing power directly from your panels or battery. If you exceed your allowance in a 12 month period, you will be charged only for the excess consumption taken by the grid at a low competitive per kWh energy rate. To participate in Community Power Network, your home must be connected to the National Electricity Market. Unfortunately, Community Power Network cannot be offered in Western Australia or to houses connected to the Ergon Network in Queensland. Community Power Network will be coming to Victoria and Tasmania soon. Your connection to Community Power Network starts shortly after the successful installation of the sonnenBatterie. The actual start date will depend on you transferring from your existing retailer to Community Power Network. sonnenFlat fees start from $30+GST/month with an ongoing contract and the ability for you to opt out at any time without an exit fee.